As ancient man experimented with ways of making cloth from fibers, he discovered that flax could be used to produce finely textured linen. Written records from the Classical Age as well as biblical allusions indicate that linen was highly valued and was associated with purity. Since that time, fine linens have continued to be cherished as heirlooms and brides have routinely included them as part of their trousseaus. This graceful collection does much to explain why the oldest of man-made fabrics have been revered for centuries as a prestige textile. Prior to the invention of the automatic loom, making linen from flax was a labor-intensive process that required patience and skill. The various steps, from the sowing of the flax seed to the weaving of the fabric, are illustrated in a set of stipple engravings that accompany the exhibit. This set of 10 large black and white photographic panels shows the modern process of linen production, which uses computer guided automatic looms, and serves as an instructive lesson in contrast. 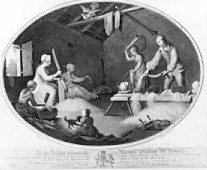 Of particular interest is a rare set of eighteenth century stipple engravings by William Hincks that portray the Irish linen industry at its height. 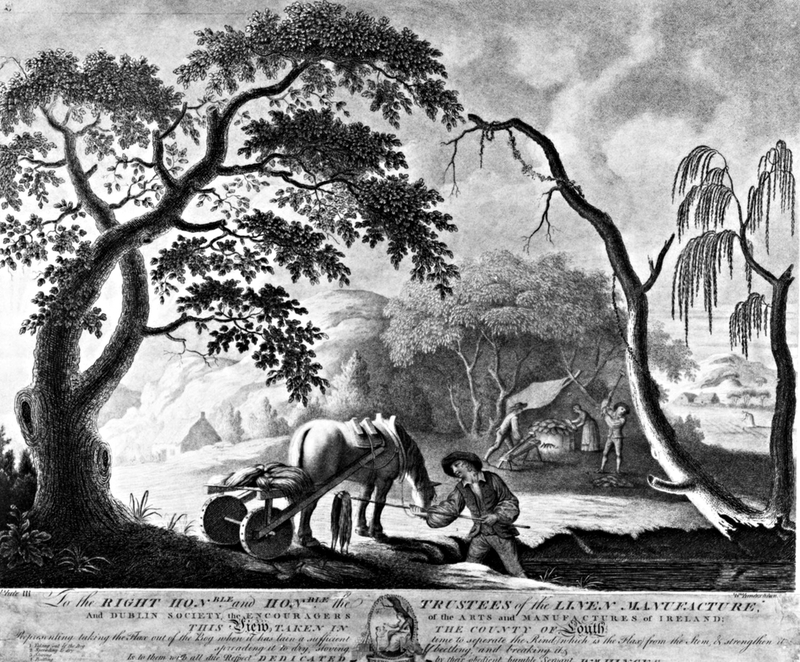 Hincks, an Irish painter and engraver, published these prints in London in 1782. Stipple was a technique in which dots instead of lines were used to produce gradations of tone. The series consists of twelve plates and records the various processes used in the manufacture of linen in Northern Ireland, from the sowing of the flax to the packing of the finished article ready for exportation at the Linen Hall in Dublin.